Never in my wildest dreams did I ever think ordering a simple drink would be so complicated. But if you’ve been to a restaurant lately, you may have also been subjected to a host of questions when you order water. Tap or bottled? Lemon instead of lime? Club soda or mineral water? Insanity! Granted, there are differences between them all so I’m here to help. Sadly, it goes beyond “sin gas or con gas” as in Spain and “sparkling” elsewhere in Europe. Just take a walk down your grocery store water aisle and you’ll see what I’m talking about. Flavor and carbonation seem to be what separates each from the others. So what makes them bubbly and which ones taste best? Taste is entirely personal, but carbonation is another thing. It occurs naturally in mineral water but all other effervescent waters get their fizz from carbon dioxide. When talking “carbonated water,” we’re talking soda, mineral, and seltzer; all of which are called “sparkling water” on menus and store aisles. Basically they are all plain water with carbonation added in varying methods. Soda water is carbonated water with subtle flavoring in the form of mineral ingredients and sodium. Mineral water traditionally comes from natural springs. Seltzer water is also plain, unflavored carbonated water but without added minerals. Sparkling water is just plain water that is carbonated. Then there’s tonic water, which isn’t actually water per se. 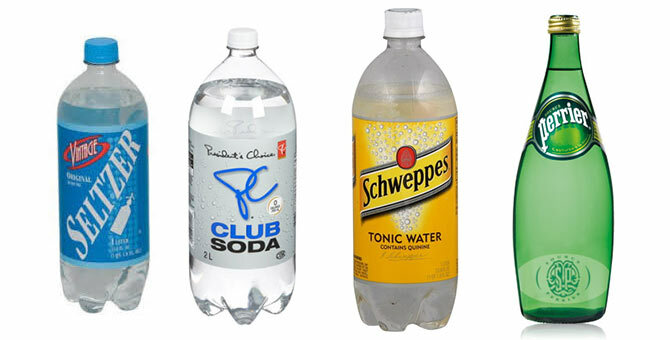 To make things even more confusing, both seltzer and club soda are called “soda water.” I recommend not using “club soda” and instead ordering seltzer or club soda specifically, because as you’ll learn below, they are not the same. So, without further ado, here then is a rundown of some of the confusion conspirators. Probably the all-time favorite. Mix it with vodka or with a refreshing lime wedge and you have yourself a great little beverage. In short, club soda is simply plain water with carbon dioxide added carbonation as well as mineral-like ingredients that enhance its flavor. Whether you choose Schweppes, Canada Dry, or any store brand, soda water is the “go to” drink for many. Club soda has many clever uses as well, most popular of course being stain removal. Who hasn’t asked a waiter or bartender for some club soda after dripping something on your clothing? Club soda also works well in rinsing chlorine out of hair, minimizing heartburn and indigestion, cleaning stuck-on food from a warm cast iron skillet, making fluffier pancakes, and watering houseplants. Think Perrier or Pellegrino. These waters come from natural springs and are often bottled at the source. They also contain minerals like salt and sulfur and for the most part, their carbonation is natural. The bottles look pretty on the table but mineral waters are the most expensive of the carbonated waters so save them for “as is” sipping and choose other waters for mixed drinks. What Is It About Topo Chico? 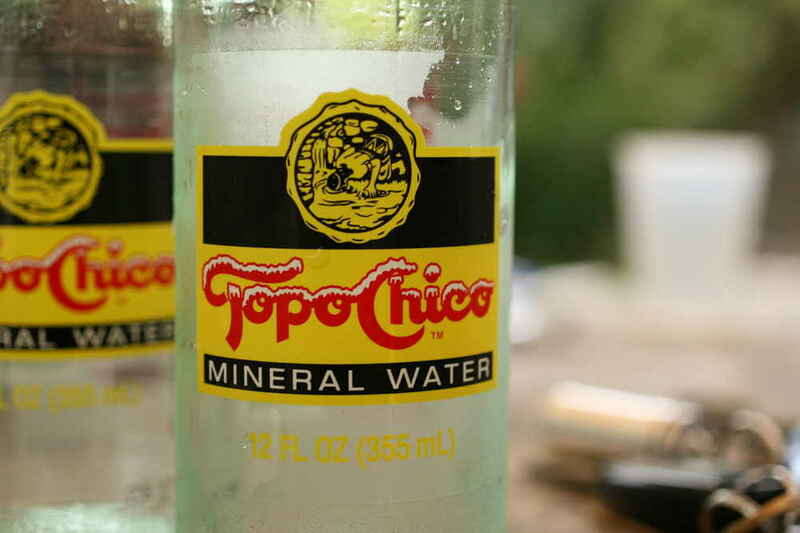 Topo Chico water from Mexico is probably the most popular mineral water where I live, and its bubbles are in fact legendary. Way back in 1440 an Aztec emperor’s daughter was gravely ill but her life was saved by the healing waters of Cerro del Topo Chico in Nuevo Leon. This lead to the bottling of the waters, which have been for sale since 1895. The company was also the first to bottle Coca-Cola in Mexico and claims the mineral composition in Topo Chico water promotes good bowel function; helps digestion and brain function; creates a sense of calm; serves as an antioxidant; and promotes improved heart, nervous system, and kidney function. Who knew?! Basically good ole plain water that’s been artificially carbonated, seltzer water is actually named after the German town of Selters and the natural springs in it. Seltzer, unlike club soda, has no added minerals and is salt-free but can be interchangeably used with club soda in most cases. It is also the type of water used to make all those flavored bottled waters you see. As I mentioned above, tonic water is actually more of a soda than a water. It is considered a carbonated soft drink and contains quinine, a bitter crystalline compound present in cinchona bark and once used as an antimalarial drug. Quinine is what gives tonic water its distinct bitter taste and helps it pair nicely with gin. 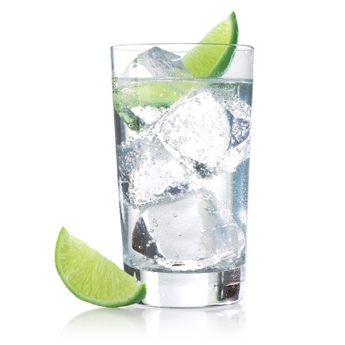 Unlike other waters, tonic water has calories: about 130 per 12 ounces. So there you have it. The 4-1-1 on bottled waters. Drink up!